Located on the sacred river Petanu, this breathtaking waterfall is a beautiful way to spend a day in the closet of nature. The abundant green surroundings and the serenity of the waters is what you would want for a perfect picnic. There are steps constructed to go down till the river and the sharp drops of water will refresh you. There are many resorts and lodges to stay if you wish to stay. Also, visit the popular attractions in the city by following Bali itinerary 4 days. It is recommended to carry extra set of clothes as the waterfall is splashy. 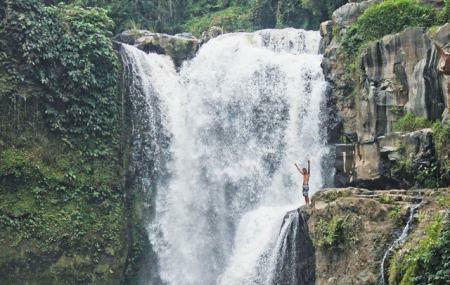 How popular is Tegenungan Waterfall? People normally club together Bali Safari & Marine Park and Setia Darma House Of Mask And Puppets while planning their visit to Tegenungan Waterfall. Read this it may will safe you not to get ripped off!! 20k entrance, then you are at the waterfall. Then we thought we can see the top of the waterfall. Yeah we can for another 15k. And that is not even worth the money. When you are up there, there are only so expensive restaurants and swimming pools that I would not go there again. And pay attention! There is one really really nice young boy waiting at the motorbikes. He looks to be nice and wants to give you a nice address to a coffee plantation which is only 5min away. We wanted to have a look because he put it in our phone and then we went to this point. It's a little street we passed it first wanted to go back and then the same guy showed up. So he followed us. We turned back up drove away and he still followed us. So be careful and don't trust him because there was no sign of any coffee plantation there. Beautiful Waterfall - worth going to, We stopped in here on a trek around the island and were happy we did. There was a 20K entry fee, but to us it was well worth it. You can see the waterfall from above, so it you are not physically fit you can still enjoy it here. If you are reasonably fit it is an easy walk down the stairs to the falls to see it up close. We are from the northwest on the US and used to seeing waterfalls, so when we see one elsewhere we are not easily impressed. This one however was up there in the top 100 waterfalls we have seen. Very beautiful and peaceful here. Worth going. This place gives us the vibe of heaven. This place makes us feel how heaven would look like. In the lap of nature lush green bushes and trees and charismatic waterfall feels like magic. The place has an aura of its own. It makes you feel energetic, you don't need a reason to be happy once you are here. Beautiful place for an ultimately natural therapy. Loved this took my kids 5 and 10 just need to be a little careful on some parts of the steps you can swim so take your swimming gear good spots for photos there is a pool club with music drinks food and a really cool pool we didn't stay there that long but you easily could. There is 2 locations for swings opportunities and the waterfall as backdrop must do so fun.